In primaERP you can have public and delegated tasks. Public tasks will be visible for all your project members. You can delegate the task by selecting one of the project members in the owner field when creating or editing the task. In order to quickly track your time, by default you will see only the tasks you are in charge of and the public tasks. Note that you are also able to see and track time on a task, which is delegated to somebody else. 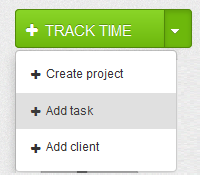 In order to see all the project tasks in the time record, you should press in the "eye" icon, next to the task field.